At Zook's Orchard we practice natural beekeeping. 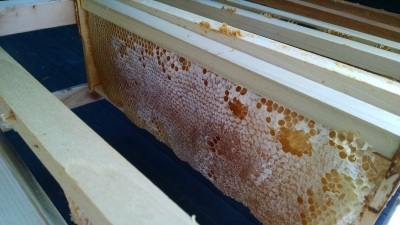 We put no chemicals or medications in our beehives, including wax foundation that 'could' be laden with chemicals. We allow our girls to build their comb to their own specifications which ultimately results in a more natural smaller cell size. This smaller cell size results in a smaller size bee and helps the bee colony keep hive-threatening pests in check. We use a Horizontal Langstroth hive of our own design which makes tending the hive much easier for the beekeeper and, therefore, much less disruptive to the bees. It also seems to keep them much calmer. What does this mean to you? We think that happier bees means better tasting honey. You be the judge! October 1, 2018. We had a great honey harvest on September 15! We harvested a total of 190 lbs of pure honey, slightly amber in color and very flavorful. We processed 127 pint jars and sold out in 1 week! All 6 beehives are strong and healthy and hive number 7, started in late July as a small nucleus colony, appears to be doing ok as well. The fall nectar flow continues as there is a lot of goldenrod and white asters blooming all over Zook's Orchard. In another few weeks we will be preparing all our hives for winter and start anxiously looking forward to spring. A Zook's Orchard honeybee gathering nectar from a Zook's Orchard blueberry blossom! We have wild blackberries everywhere and the honeybees love the blossoms. 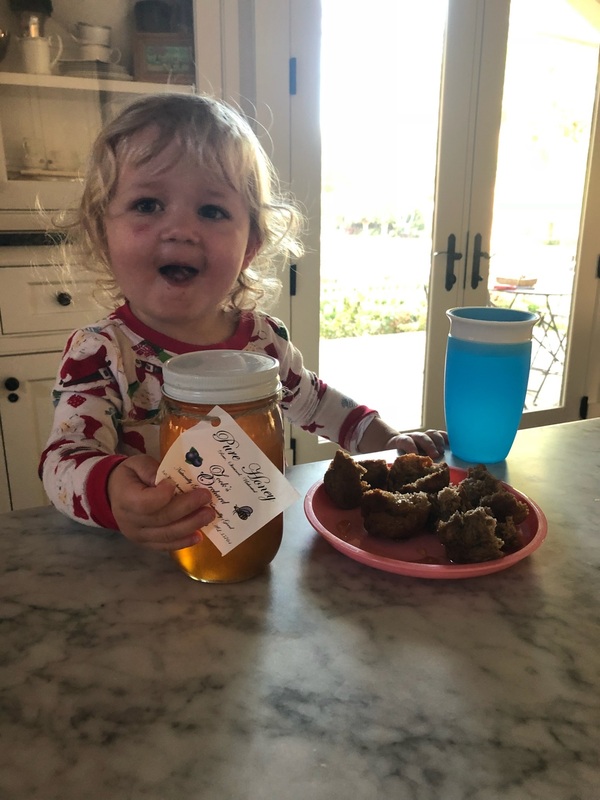 Some say that blackberry honey is some of the best! Zook's Orchard has over 100 redbud trees and our honeybees love them! These early blooming trees get the girls off to a good start with their nectar and pollen gathering. Our girls love the Zook's Orchard fall goldenrod! Every fall Zook's Orchard is covered with wild goldenrod and white asters which both provide our honey bees with one final source of pollen and nectar for their buildup of honey stores going into winter. Our beehives are surrounded by goldenrod!